ASPROS LAGOS [White Hare] Red Dry Wine Douloufakis Winery is not available. Aspros Lagos Douloufakis full bodied and balanced Cretan Cabernet Sauvignon with deep red colour and fruity full nose with oak accents and peppery minty notes. Aspros Lagos [White Hare] is a unique, full bodied and balanced Cretan Cabernet Sauvignon with deep red colour and fruity full nose with oak accents and peppery minty notes. Full bodied, rich, long texture with soft tannins melded nicely with the other components. Pleasure finish. The island's terroir reveals the unique character of this wine. The sun and the warm climate offer maturity and volume, balancing the strong tannins. Classic red vinification with fermentation at 18?C in stainless steel tanks. Best enjoyed with red meat, game, rich sauce or hard yellow cheese at about 18°C. The viticulture and wine production is tradition for Douloufakis Family carried from generation to generation as the spirit of valuable experience. Nowadays the vine-yard cultivation and wine-production tradition of the Family is continued by the grandson Nikolas Douloufakis who studied Oenology in Italy (Alba Intituto Agrario-Spezialitato in Diviticultura e Enologia). The privately owned vineyards are situated in Dafnes a village close to Iraklio in Crete, at an altitude of 350 meters on hillsides. 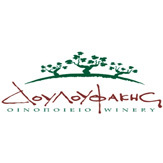 Nick Douloufakis develops both cretan indigenous varieties such as Liatiko, Kotsifali, Vilana, Vidiano and international as Syrah, Cabernet Sauvignon, Chardonnay, etc. It was in 1952 that Douloufakis Family was awarded for the quality of its wines. Since then they produce award-winning wines. The winery's vineyards have applied organic methods of supervising by the organization “DIO” and the wines are certificated according to the standards (EC) 834/07 and USDA-NOP.